Researching and developing new teaching methodologies and resources are at the core of what Eva and Padraig strive to achieve within the Music4Children programme. Currently, they are developing a number of teaching resources that will assist both early childhood practitioners and parents to bring music to their children. By adopting a process of ‘active research’ and detailed documentation Eva and Padraig reflect weekly on their teaching in order to provide an most advantageous educational environment for the children. 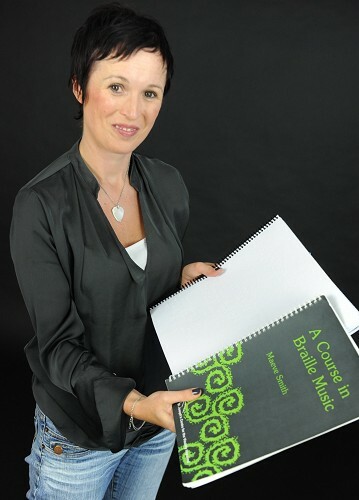 Music and accessibility have become central aspects to Eva’s contribution to music education and Music4Children have become integral in emphasising the importance of accessibility. Being actively involved in current research projects has enabled the tutors at Music4Children to increase the accessibility of the programme. Most recently, Music4Children has been involved in a project entitled Hands On: Feel the Music a collaborative research project that is taking place between the Department of Music and the Disability Support Service UCC. Lead by Eva, the project aims to increase the accessibility of music to blind and visually impaired students. The project resulted in the publication of a handbook that for the first time has brought national and international experts together in order to find appropriate methodologies for teaching blind and visually impaired students alongside their sighted peers. As part of this project Eva has become literate in braille and is currently learning braille music. Working with blind and visually impaired students continues to form an integral element of Eva’s research portfolio. As an extension of this work and that which was inspired by Prof. Adam Ockelford, Eva is about to embark on a research project that will investigate and access the importance of music in the lives of children with Battens Disease.